Throw a Pie at Caitlin?! At Dave?! … At the Alliance Prez?! Annual Video Seminar Renamed to Convergence TV & Call for Speakers! That’s a wrap for the ICA Golf and Grill Classic – Registration has finally closed this week and we’re a little over a week out from our outing on the 18th & 19th! Thank you to everyone who registered. We have a great group of members golfing both days. Golf pairings will be sentout and posted early next week. 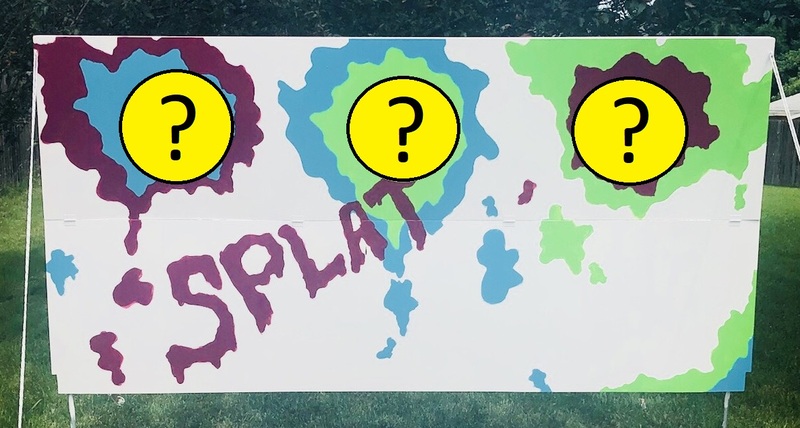 Who will we “pie” at the TelePAC pie throwing fundraiser during the BBQ at the Alliance’s Annual Golf and Grill Classic?! Stay tuned to find out next week … ! June 11, 2018 is the deadline for ISPs to publicly disclose information about their network management practices, performance characteristics, and commercial terms either on an “easily accessible” website such as the company’s website, or through the portal established by the FCC. June 11th is the date the FCC’s Restoring Internet Freedom Order, adopting ISP transparency reporting requirements, takes effect. ISPs choosing to submit their required disclosures to the FCC should do so electronically, in a format that is accessible to people with disabilities via http://www.fcc.gov/isp-disclosures. An ISP that does not submit its required disclosure to the FCC through this portal will be deemed as having elected to provide it on a publicly available, easily accessible website of its choosing. An ISP that submits its required disclosure to the FCC and later elects to provide it on a publicly available, easily accessible website of its choosing should inform the FCC of this change by filing via the FCC portal a clear statement of the change, including the website where consumers can find the required disclosure. The disclosure must include accurate information regarding the ISP’s network management practices, performance characteristics, and commercial terms of its broadband Internet access services, as required by paragraphs 218 – 223 of the Restoring Internet Freedom Order. The required information, including but not limited to, blocking, throttling, congestion management, price and privacy policies, should already be commonly covered in your Network Management and Acceptable Use Policy as a result of the FCC’s Net Neutrality Regulations in 2011. For more information and links about the FCC’s Restoring Internet Freedom Order, click here. As an example, Aureon has shared its disclosure, which is available by clicking here. (Please contact Dave Duncan for more information). The Alliance Board of Directors held its annual planning session, which we call “Shared Expectations” this week. The meeting was led by Board VP Ryan Boone, and it continued the Board’s analysis and discussion of changing face of the communications industry and how the Alliance needs to adapt to best serve members. During the Shared Expectations meeting, the Board continued its ongoing discussions about the changing face of our industry and the migration toward an all-broadband focus. The Board also discussed plans to create a leadership program to help develop next generation leaders and improve mentorship opportunities. Approved the 2017 audited financial statements prepared by BKD, LLC. The Board thanks President Mark Thoma and his staff for hosting the meeting at the Winnebago Cooperative Telecom Association in Lake Mills. As the Alliance Board of Directors guides the association through the continuing evolution from being a LEC-based association to a broadband-focused association, the Board established a “Future Dues Task Force” to examine ways to transition our member dues away from relying on access lines. Current Alliance dues are based on an aggregation of access line counts and broadband connections inside the member’s ILEC area. Transitioning dues for “Active,” “CLEC,” and “Other Members” to fixed broadband counts and eliminating access line counts from the calculation. The precise dues mechanism cannot be finalized until the Task Force has data identifying members’ broadband connections outside of their ILEC areas. Currently, members self-report their broadband counts inside their ILEC areas. In order to proceed, the Future Dues Task Force will be sending a broadband count request to all current Active members this summer, to identify the number of broadband customers served outside your ILEC areas. We appreciate your timely response when we distribute it, so please stay tuned. JSI invites telco CFOs, accountants, and other staff who need to understand the latest rules affecting their companies' balance sheets and cost studies to attend its popular Part 32 & Part 64 Accounting Seminar on September 25th and its Separations & Access seminar from September 26-28. Both sessions are in Nashville, TN. Registration is open and JSI is offering an Early Bird discount on the two-seminar bundle until July 1. Click here for more information. The FCC’s Wireline Competition Bureau has extended the July 2nd deadline for ETCs to file annual reporting Form 481 to July 16th. The two-week extension gives additional time to process various reforms updating annual reporting requirements for ETCs and approval by the Office of Management and Budget of the modified information collection. USAC instructs that ETC can log into E-File to access the FCC Form 481. USAC has posted draft versions of the FCC Form 481 template, filing instructions and all necessary upload templates on its website, which are draft form until PRA approval is obtained. USAC advises that carriers may begin the filing process but will not be able to certify the filing until PRA approval is granted. USAC will notify users when the certify buttons are activated. The FCC reminds ETCs that this extension applies only to Form 481. ETCs must still report rates on their Rate Floor Form by July 2, 2018. As a direct result of advocacy by NTCA, the FCC has agreed that customers of small, rural “rate-of-return” providers are unfairly paying USF fees on broadband Internet access transmission service when no other ISPs must similarly contribute to the USF. This week, the FCC granted a petition for forbearance that will, in effect, waive the requirement for small, rural carriers to contribute to the USF on their broadband Internet access transmission service revenues. The FCC says this move will make broadband service more affordable for these carriers’ customers in rural America. Industry estimates indicate this will result in a savings of about $68 million per year by customers of rate of return carriers. The Order has not yet been released. The text of the Order has not yet been released. The FCC continues to address “access arbitrage” or “traffic pumping” with a new Notice of Proposed Rule making. The FCC seeks comment on proposed rules to give access-stimulating LECs two choices about how they connect to IXCs: (1) be financially responsible for calls delivered to their networks so they, rather than IXCs, pay for the delivery of calls to their end office or the functional equivalent; or (2) accept direct connections either from the IXC or an intermediate access provider of the IXC’s choice, allowing IXCs to bypass intermediate access providers selected by the access-stimulating LEC. In the alternative, the FCC seeks comment on moving all traffic bound for an access-stimulating LEC to bill-and-keep. In its proposed rules, the FCC asks several questions about the provision of Centralized Equal Access. The Alliance Board and Regulatory Relations Committee are examining whether to file comments directed specifically to the CEA issues raised by the FCC. Click here to read the proposed rules. Federal Communications Commission Chairman Ajit Pai has confirmed that President Donald Trump is nominating Geoffrey Starks as a commissioner at the FCC, replacing the spot left by Mignon Clyburn. Starks has worked at the FCC's Enforcement Bureau, as well as the Justice Department, and his nomination is subject to Senate confirmation. This week, NTCA and the Alliance filed joint comments with the FCC to encourage the Commission to take expedited action to approve the application filed by Hospers Telephone Exchange, Inc. d/b/a HTC Communications (“Hospers”) and Mutual Telephone Company d/b/a Premier Communications (“Mutual”) requesting approval to transfer control of Hospers to Mutual. The Associations noted the requested transfer of control will result in greater efficiencies while allowing Mutual to effectively serve customers in all of the locations currently served separately by Hospers and Mutual. Click here to see the filing. USAC filed its latest demand projections with the FCC last week that indicates the USF contribution factor will decrease from 18.4% to 17.9% for third quarter 2018. Consistent with recent quarterly data, demand under the Schools & Libraries program (E-Rate) did not meet budgeted amounts, and thus contributed to a lower contributions factor. For the first time in about ten years, the contributions base increased, but whether this is a single aberration or the beginning (continuation) of a trend is yet to be determined. In response to the IUB’s May 11, 2018 Order Regarding Intrastate Access Tariff Filings, Docket No. IAC-2017-2214, the Alliance filed an FCC Compliance Filing – Intrastate Access Tariff on May 14th. In our filing, the Alliance confirmed that the ITA Intrastate Access Tariff is compliant with the requirements of the FCC’s November 2011 order concerning universal service and intercarrier compensation reform. Companies that concur in the ITA Access Tariff were permitted to file a letter with the IUB indicating their concurrence and this approval of ITA’s Tariff carries over to concurring members. In addition, the IUB has approved tariff filings by a number of ITCs who use their own tariff. Click here to read the IUB approval letter. 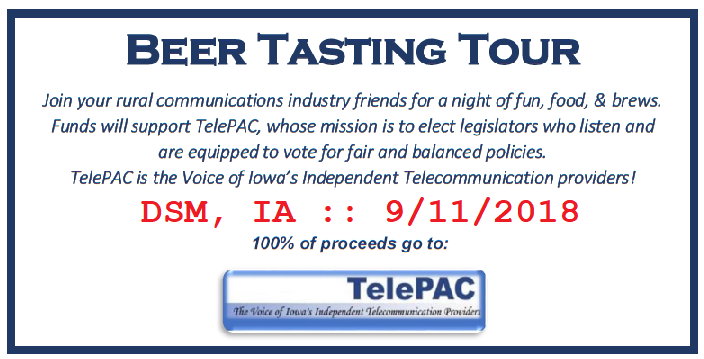 WOW – Alliance member boards sure have been generous to the TelePAC! We tremendously appreciate this and want to ensure that every board gets credit for their generosity and commitment to aiding the legislative initiatives of the Alliance. We are fortunate to have such a robust membership, unfortunately, this also means that we don’t know the number of directors that each of our members has on their board. Accordingly, when we receive checks from several of your directors, we don’t know at what point we have received checks from 100% of the board. So, we request your help with this! 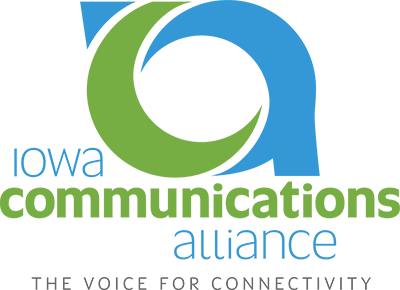 Comments on "Iowa Communicator - June 8, 2018"